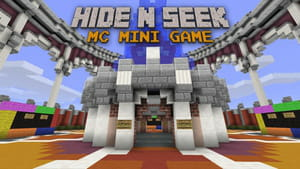 Hide N Seek: Mini Game With Worldwide Multiplayer is a multiplayer game where the user has to hide and seek other gamers in a kind of labyrinth. Developed by Wang Wei, the game enters players into a virtual "hide and seek" experience. Gameplay: Hide N Seek: Mini Game With Worldwide Multiplayer is reminding gamers of their childhood's Hide-and-Seek or Hide-and-go-Seek game. But for this turn, the game is played virtually on Apple devices. The same feeling and excitement remain intact. At the beginning, the system chooses a player as Seeker and others as Hiders. The hider can become a seeker once he was sought by seeker. Controls: the player guides himself thanks to a DPad (left, right, back and straight controls). It is possible to make a jump via tapping on the screen. To trigger an event, the gamer just has to click on the "Sign" block located on the display. Multiplayer mode: requiring an Internet connection, Hide N Seek: Mini Game With Worldwide Multiplayer is played with several gamers simultaneously. Each room can contain up to 24 players who are available online. They can be assigned to play Hider or Seeker. Enhancements: this latest version has been improved in terms of game mode. For instance, in Classic Mode, the Hider cannot kill Seekers. Concerning Survival Mode, Hide N Seek: Mini Game With Worldwide Multiplayer players are endowed with a wooden sword enabling to kill Seekers. This game is tricky and addictive. It is integrated in Game Center. Latest update on November 20, 2016 at 02:32 PM.